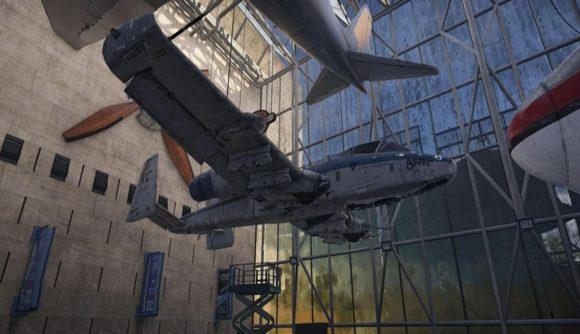 Reddit user Athyn- has discovered that Rainbow Six Siege’s Jager has been paid homage to in The Division 2’s Air and Space museum. The easter egg shows an A10 Warthog suspended and on display, with Jager’s full name “Marius “Jager” Streicher” written under the cockpit and his operator icon emblazoned on the tail. The plane is even missing a gun, which fans have speculated is fact the very same autocannon used in the Division 2’s The Capitol stronghold mission. It’s always cool to see when games are tied together in subtle ways like this, but it’s almost sad to think that Jager’s days of manic helicopter flying are over during the events of The Division’s post-apocalyptic America. If you want to check out the easter egg for yourself, head into the Air and Space museum, just on the edge of the Southwest sector of the map, and keep your eyes peeled in the aircraft display room. Sadly, the plane isn’t flyable, but it’s fun to imagine Jager might pop out at any moment and help you tackle the political wastes of DC. The Division 2 isn’t all gunfire and revolution, and you don’t have to hide in a museum to find a moment of quiet. Ian recently found calm by taking photographs of the game’s wildlife, which almost makes the post-apocalypse look romantic and pleasant. If finding easter eggs isn’t really your concern, check out all the exotic weapons we’ve found instead. They’re just as delightful to find, but might help you a bit more in PvP.